Yep it’s true! 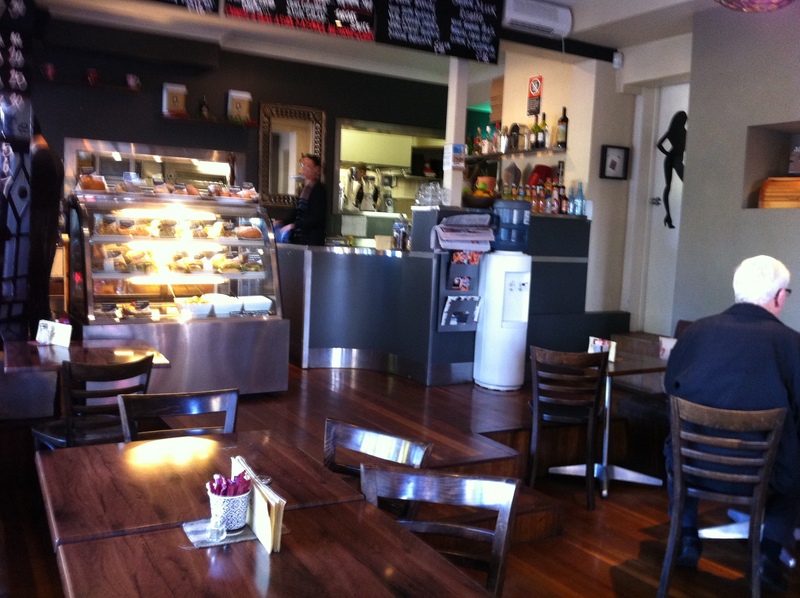 I walk past 11 other cafes including a steep hill-climb to get to my favourite one. So you’d have to ask – why?! Reason #5: I like the ambience – a unique blend of vibrancy and warmth. Reason #4: The food is stunning and well priced. Reason #3: The coffee is brilliant every time. Reason #2: They’re always prepared to tailor and customise my order. Reason #1: The owner (Bianca) knows my name & makes me feel welcome. Now when I think about the retail outlets of Christianity (we call them “church”) I guess there are plenty to choose from that dish up a good “product” on Sunday. Seems to me though, the thing that’s much harder to find is a church that customises its “programs”, learns your name and makes you feel welcome. Am I being a bit unfair do you think? A bit harsh? My wife Jacqui and I spent 3 years several years ago looking for a church – not just to be consumers, but to offer the gifts and abilities that God had given us, in His service. Now we found one church that sang some great songs … but you didn’t need to take your Bible because you were unlikely to need it. And unless you attended twice on Sunday; unless you “got with the program”, you just weren’t committed. At the other end of the spectrum, we attended a more traditional church for 12 months – strong on preaching the Word. But it took 9 months before we were invited out for so much as a cup of coffee. When Jacqui collapsed at work and was rushed into hospital for major surgery, only one person visited her … once. And when we left, it took 6 months for our home group leader to email us to see where we were. So as Christ-followers (imperfect though we are), we decided that these (and quite a few other) churches were not the places to invest that which God had given us. Fortunately since then, we have found a church where we’re loved and accepted. A church that’s making a difference in the marketplace (albeit imperfectly). But after trying about a dozen, the question is … Why did it take so long to find a ‘Bianca’ in the Kingdom of God? I have been going to our church for 5 years now….Two years ago my 15 year old son died suddenly for no apparent reason…He was apart of the youth group of the church and gave his life to the Lord the Friday night before as it all was happening I called the pastors to come to the hospital, they prayed for us after my son had passed away and came around a few days later to organise the funeral…I didnt come back around to see us again until 12 months later when I had complained to the leadership for their lack of support…He came around and said that it wasnt in his nature to be nuturing that it wasnt his love language and that he wasnt a Pastor sort of pastor and that I had had abandonment issues as my father had never been there for me as a child.And that I was looking for that kind of love and support from him..God had provided support for us through our loving school chaplin so He did provide…I have major issues when I hear our Pastor preach on Love and loving one another in church…I had alot of resentments and felt we need to practice what we preach…I went back to him the other day and he repeated to me that no matter what I said that I would not change his mind on his position….He told me he was a warrior of God and his focus was on preaching not being there for the people as it wasnt his love language…He said he would offer me councelling for my abandonment issues that I needed to deal with…I have been giving this to God and am yet to feel the fogiveness I know I should give as the Lord has been telling me to do so…I just keep getting in my mind “that you shall know them by their fruits” and am upset that I feel this way…I just want this to lift from me I had his 2 year anniversary yesterday and was thankful they sent me a card…Im just trying to understand their kind of love and wonder if I am missing some thing…. sometimes i am real thankful for my culture.. out here in India we stick out for each other.. the culture has in built mechanisms during such seasons.. inspite of the Western Influence .. none of our funerals have no attendance .. we go out of our way to make them feel cared and loved.. its a cultural thing.,. I am humbled in the presence of God in a remote corner of Indonesia or a ship on the sea in Vietnam. A village church where an old man preached on the same verse for half an hour in the local script (which I understand). An island on the Andamans or in the underground church in Qatar or at John’s Stott church. I travelled and found God in these places. I went to a Pentecostal church in Singapore and I found God there. One CHURCH, one FAITH, one BAPTISM. One God. The Kingdom of God is at hand. I struggle not to judge. I have problems in my own church, but I try to see where I can add my faith experiences to the witness of the church. Give out bread or hand out a hymn sheet to the feeble-sighted. Help with a person who needs a hand held while he goes to the loo. Find a chair or help him/her pick up the dropped item. God is right there. I worship in the beauty of Holiness. One CHURCH, one FAITH, one BAPTISM. One God. The Kingdom of God is at hand…..The coffee is great whereever, because i learn the names of the person serving me! thanks so much for this amazing perspective. What a humble, servants heart you have. What a great reality check for those of us who are spoiled by the freedom to worship and a plethora of churches. i love the quote … the coffee is great whereever ..because i learn the name of the person serving me 😀 awesome !!! There has been such a rich and amazing response to this post. Thank you all so much for sharing your experiences – for better or for worse. What have I learned from each of you? That in all that I do as a part of my local community of faith … the love that God has poured out on me through Jesus His Son needs to shine more and more out of my life into the lives of others. None of us can be all things to all people. But we can be the person God made us to be … and be that person in love. And the funny thing about love … Is that it’s infectious. Maybe when I love … Someone else will catch it. I relate to so many of these comments. Raised a Catholic I learned how to be religious but not loving as I only got rules not love for 50 years. I found love in Spirit filled Christians when I was left alone with 3 kids to raise and family overseas. This small evangalical church of loving folk encouraged me to get back home and they prayed for a church family to find me – which happened. I have been blessed by loving supportive people for past 17 years and I have happily given of my talents and encouragement to them – we praise God in song but also in loving each other as Jesus taught us. I think I have finally found a good church, but I am not holding my breath. Boy, was I in for a shock when first decided to join a church! If it wasn’t for the fact that I knew for a fact that there was a God, I would have walked out and never gone back!!! Try being a single mother and new in town and fitting in to church! One lady walks up to me and says,’..and where is the father….? ?’ It just so happened that he I had to leave him in a hurry while I was pregnant as he was beating me up! But the lady didn’t hang around for the answer. I don’t think she cared either but was out to make me feel like a total loser. I realise now about families and how you are supposed to get married and all that stuff, but I had no idea at the time! Coming from a broken home myself, a mother who comitted suicide when I was 5, and a father who dissapeared, I had all kind of challenges ahead and made a lot of wrong turns and decisions as I grew up. I find Christians the hardest people to make friends with?? I thought it would be the other way around?? What an agonizing experience you’ve been through Ingrid, both in your personal life and in your introduction to church. If it had been Jesus greeting you that day He would have taken you by the hand and sat with you. I had a mildly similar experience as a divorced woman with kids in tow. The judgment and isolation is so painful, after the devastation of family break-down, and there’s no warm and comforting place to go, even to the House of God. I have found God Himself though to be infinitely bigger than this, and His grace is completely warm and enfolding. I bathed myself in the Psalms, Proverbs & Beatitudes and that old devotional book Streams in the Desert. Sadly Christians seem to judge each other by what they do or don’t do, rather than showing Christ’s unconditional warmth and acceptance. God bless you Ingrid, and continue to lead you by His Spirit. He is faithful. Hugs, Carol. As i read this weeks discussion, tears ran down my face and my heart ached simply because my prayer has been Father i need to find a Church where i can fellowship with brothers and sisters of Christ. Where i can worship, praise,but most of all listen to the word that Our Heavenly Father gave us. My church is in Waterbury, CT. however I live in another state Bronx, NY. talk about a house of GOD: from the moment you park your car theres an overwhelminig sensation, that one have to say Thank you Jesus. As one comes in, TRUST me One does not leave: One of its many blessings is if your there one week and not the other someone calls you to make sure your ok, and let you know that you were missed. I have been looking for a church closer to my home due to I now dont have a vehicle, so i visited two other churches. I was so hurt that in the middle of the night I ask the Lord to reveal to me why was I feeling so dispair. And it was reveal: I saw multitude of people scatter into differant sections and into groups, some were laying, some was standing, some were with there hands lifted, and some where just eating others were reading, then I realized that all pastures may look green and good to eat from, however that does not mean that one should get nourished from one secction of a pasture. Please keep me in prayer, I’m looking for a church that is not man made but Holy Spirt made!! Having moved around for 20 years, i have found it is a problem only understood by those in a similar predicament. Also, i have found so few people have been part of a genuinely life changing church, they simply don’t realise what they are missing. However they are worth chasing down. When that happens, it is all worthwhile, and others notice the way your life changes! It’s a very interesting thing for me, because let me ask you..
Do we choose to follow God? or God chooses us to follow him? If it’s both, then who makes the first move? I share your disillusionment too Vicki. We’re so reluctant to speak negatively of churches, but it is my personal belief that many of us are “outside the camp” now, carrying a lot of pain from failed church encounters, though longing for relationship with God and not knowing quite how to go about having fellowship with other Christians where there’s no judgment or coldness. Berni, thanks for opening this up. Potentially it’s a minefield, but your gracious moderation is really helping to contain the emotion that gets dredged up. That’s an interesting comment Jacques, particularly about the family being the priority. It is easy for people in churches, with all good intentions, to be very focused on serving God and being part of Christian ministry, but in subtle ways may begin to prioritise this over nurturing the family. I have five children who are now in their teens and 20’s, and I do regret that life became so busy and church focused that opportunities to just “be” as a family became difficult to find. Balance is better. The last 7 years I’ve devoted to re-gathering and nurturing my children as my priority, and each of them is now returning to the Lord and to church. I am humbled and grateful before God. Hi Berni, thank you so much for such an interesting perspective on this issue…I have been to many churches over my walk with God & have encountered the same issues as many others…I cannot understand why this happens? We are supposed to be Christians, & all that goes with it…I have been going to a new church, for a few months, I can understand why people don’t want anything to do with church or Christians…sorry for being so blunt, but I can relate to all of the comments posted….thanks for this blog Berni…I hope Jacqui is feeling much better…bless you & your ministry…. In the Catholic Church our focus on Sunday is on Worshiping God as a body through the Eucharist not a social gathering.there are many groups, associations and Catholic organizations to join where you can meet people on a personal basis.Anyway our first priority should always be our family relationships. Jacques, thanks for your perspective. I’m not sure that what people are talking about so much is socialising, but rather bonding together as God’s people; God’s family – as the body of Christ to demonstrate His love both within the community and to those from the outside. There are quite a few biblical analogies of the church being Christ’s body – Romans 12 and 1 Corinthians 12 for instance – as there are exhortations for us to live in love together sharing each others’ burdens as well as our God-given gifts – i.e. putting our faith into action. I’m posting from Singapore at the moment for work reasons, but I absolutely share your perspective on your first post. and I must say, some of them made me feel really welcome, whereas others not so much. 1. Not 1 Church is the same. 2. God is not in all churches. It’s painful as a Christian to see this, and maybe many people won’t agree with me, but it makes me wonder a lot of times what about all those people who attend a church that misguide Christians? but isn’t it the responsibility of all Christians to govern their churches as well and not just up to the pastors? Going back to Berni’s perspective, I think people choose coffee shops, not because of the actual coffee, but on the people who make it. We choose to go a particular church based on the people in it, based on how connected these people are to GOD. Hope you’re enjoying Singapore – one of my favorite places. Thanks so much for the insights. With all the churches you’ve been to around the world, is there anything in your experience that influences their culture of openness and connectedness (or the opposite of those)? Yes, I’ve seen major influences from the church to the people, but these influences vary quite a lot depending on the social issues affecting that community, such as poverty, drugs, crimes. Every church does it differently, and some of them work and others don’t…, it’s kinda like God chooses different ways to reach us.. But..
I’ve been to the complete opposite of these..
there are some churches I’ve been in China, that requires you to have an foreign passport to participate (They have 2 ministries, 1 local and 1 for foreigners) and I’ve been told by the pastor that there is a government official(local ministry) that checks the topics of discussion before the pastor can talk about them. and I think that we’re meant to share that with everyone. Absolutely I believe we can make a difference wherever we are, and perhaps this is the message Christ left us with. However, based on my personal experience, there are some situations where one seems to be “different” in a situation where conformity is promoted and the “powers that be” and pressures to conform are too great to keep fighting against. But then … perhaps this is the way the Lord moves us on to another situation where He can use us. Maybe that’s not always in a “formal” church situation ? although of course, I know this is ideal. Hmmmmmmmm seems like this is happening all over. I too am still walking BUT why do I think that its perhaps up to us individually to make a difference where ever we fellowship.Pray for our Pastors and leadership and pray for our churches and fellowships instead of looking for the perfect church HMMMM seems like God is speaking to me???????? Now there’s a radical thought! Hi All, My family and I were really lucky. When I became a christian I was really ill and had a good friend who helped me alot who was a christian. She invited our family to the church she went to and we were very warmly welcomed right from the start I must admit it was actually abit off putting when we got invited back to someones house for lunch on our second visit but we got used to this kind of thing. We have made lots of friends through the church and have lots of social outings with them…its a really strong community and the church lives out its motto…”A Place To Belong”. Sad that so many others have not had similar experiences. God certainly guided us to the perfect church, I wonder why this doesnt always happen? you are truly blessed. There’s something about the DNA of a church it seems. Either it has a culture that’s warm, friendly, inviting and accepting … or it doesn’t. I went to a church for around 7-8 years, I joined a women’s group, had a mentor who taught the young mum’s in the church and was really enjoying it. After many years there though, I felt like It was more like watching a performance, the sleek band that practiced for hours on end. The same sermons preached year after year, the same jokes. But what made me leave was some of the things I witnessed. An unwashed mental man who has attended for a long time, went to sit in the front row, he was immediately escorted to the back! as the front seats were for the pastors and family’s only. And one man who was also suffering from Alzheimer’s having trouble with the loudness of the band, was yelling out, and he too was escorted out of the church altogether. So I know we are meant to go to church to fellowship and worship the Lord, not to be entertained, but I also thought that Jesus taught us to love one another, to wash their feet, to feed and clothe, so when I saw this happening in this church, I had had enough and decided to have a break. This lasted for a few years, till I felt ready to find another church that was small, friendly and accepting, and so far the one I have found has been all of the above, but it’s early days, so I guess I shall see. But God willing, it will be a place of blessing to me and my family. I have done my roundabout with churches and ended up at the Salvos, which is where I started as a kid. I always said I’d NEVER go back. God has a sense of humour as circumstances drove me back. It has split my family as my kids continue to go to the church that I can barely walk in the door of. However they are finding their place and are definitely young people who make others feel welcome. Especially my extrovert 17 year old, who regularly comes home from church saying she’s made a new friend today. My experience has led me to believe that sometimes God doesn’t want us in these churches that we think we want to be in, it’s not His plan and purpose so He allows us ‘not to fit in’ so we go somewhere else. I was treated appallingly and only because of that moved on. I have found my niche and it is great for me, for now. I think there could be many theories for why certain churches are the way they are. One of the many theories that I’ve considered is that some types of churches provide a safe, structured place for people who want to belong somewhere, but who don’t necessarily like or know how to connect with other people at a deeper level. There could be a higher proportion of people who have weaker social/communication skills combined with perhaps more rigid values or need for routine/order/structure. Any thoughts? I think you’re right in one sense. There are quite a number of people who deliberately attend larger churches where you need to “opt in” to be part of the community simply because of the size. I know quite a few people, who deliberately go to such churches and choose not to opt in because they don’t want to connect. That’s not a criticism of the church. Often these churches are very deliberate about having welcomers, home groups, and other avenues for connecting, becuse they know how difficult it would otherwise be for people to become part of a community. Happily, where we are now is life-giving, and we participate in both giving and receiving of gifts and services. But it took three years to find a home. Praise God for finding us. I agree it is very hard. I was with the same church for 12 years and no-one contacted me after I left and it has been 3 years….. I joined another church after much prayer and it seemed so good for my children. After almost 2 years a lady said hello and introdused herself asking if this was my first time. I am quite introverted so struggle with meeting people but joined a small group after 18 months. They changed the night about 4 months later and I could no longer attend. Only one lady would talk to me at the church services and I eventually stopped going. No one has ever contacted me and it has been about 4 months. My adult daughter’s small group also has not contacted her as both my daughters won’t go if I don’t. I really miss church even though I don’t really fit in, I still liked being there. I really do feel as though I don’t belong. My biggest regret about that is my daughters are also missing out. Hi Carol Grigg- Im Soraya from Bronx,NY. I applaued you,Two thumps up!! Ill tell you why. Soraya, thank you. What a loving response. My prayers are with you too that very soon you’ll find other warm-hearted souls like yourself that you can fellowship and worship comfortably with. Hugs. I had to chuckle a bit when I read your post. It is true there are not many “Bianca”‘s in God’s Kingdom. It was hard for me to find a church which was welcoming. I live in CT USA. New England is not known to be very welcoming place either. I have moved here 11 years ago and I have noticed that all my friends are not from New England but “foreigners”. Church, here has the same cold feeling as the area. I am hoping my generation might stir things a bit and challenge the statu quo. Thank you for your blog! I like your love for Jesus and your unique perspective. I am thankful that I didn’t need to search for the ‘right’ fellowship. My small town has a Catholic church, Anglican/Uniting and Winton Christian Fellowship. Even before we moved out here I contacted one of the ladies (from the Fellowship) and had a wonderful reception so when I first walked through the door they were so welcoming and easy to be with. Over the years I have got to know them and they are very ‘real’ people. God has been so faithful and I am learning so much through my fellowship.